Vacations and traveling are fun but can get really expensive. Hotels, flights, rental cars-these all add up scarily quickly. So how can you see the world and enjoy your vacations without breaking the bank? The best way to travel on a budget is by utilizing credit cards. There are some who manage to do crazy expensive trips just using credit card points and perks. Check out dansdeals.com or http://millionmilesecrets.com/ for advice on how to do that. I am going to focus on some easier and simpler ways to use credit cards for travel. The concept is simple: open a credit card, spend the minimum spend to receive the sign-up bonus and then open another credit card and do the same thing. DO NOT SPEND MONEY ON A CREDIT CARD THAT YOU CANNOT PAY BACK IMMEDIATELY. The point is not to rack up credit card debt but to put your regular spending on a credit card that will give you the most bang for your buck. I will be talking more about my rules for credit cards in a later post. If you are creative, okay with being limited in your flight and hotel options than you can do some great trips for cheap! There are other credit cards that you can use as well: Jet Blue, Chase Sapphire, Southwest, Hyatt etc. Do some research and figure out which is the best for where you want to travel! Part of this post originally appeared in an article on Student Loan Hero’s Blog. Read the full article here. We’ve all heard the common advice about shopping on a budget: make a list and stick to it. We’ve all heard it. Plan out what you need and then only buy what you need. Meal plan, meal plan- we’ve all heard it! However, when it comes to foods shopping however, I say: do the opposite! When shopping on a budget, I go to the store, see what’s on sale and then plan my meals around what I buy. So I do meal plan- but based on what I bought, I don’t buy based on what I plan. Tomatoes are on sale? Go home and google tomato recipes. Canned corn is on sale? Look in your cookbooks for recipes with corn. Some of my favorite food recipes I found because I was searching what to do with food that I bought. And you will discover new foods that you like. I had a memorable two weeks where I tried tons of beet dishes because beets were dirt cheap. Turns out I really like beets! Obviously don’t buy two pounds of bulgur just because it was on sale if you never tried it before and you may not like it but once you do try it and love it, run out and buy some more- some for eating and some for stocking up. It’s a good habit to buy one extra thing to keep in your pantry. When a staple or a favorite goes on sale, buy it and put it in your closet. When you plan your meals around what’s cheap and available you can stay within your budget and eat deliciously even when you’re tightly budgeted. Don’t fall into the trap of finding delicious recipes online that have exotic or expensive ingredients and then go buy them. Buy the ingredients and then go find the delicious recipes! Do you have more tips on how to save money on food? Hit the comments! I was honored to be quoted in a great article about saving money on back to school supplies. 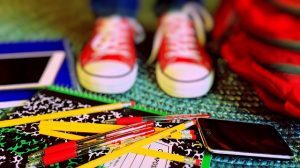 School supplies shopping does not need to strike terror in your heart when you get that dreaded list. It also does not need to break the bank (too much). just like every big purchase proper planning and budgeting can help take the sting out a little. 1. Make a budget and stick to it. If you have older kids, let them know in advance how much they have to spend. This way they can pick which items they want to “splurge” on and which ones they don’t. They may want to spend a lot on a nice notebook but stick to the cheaper pencils and pens. 2. Shop online and shop early. Many stores have back-to-school deals on certain items already. Quickly glance through some deal sites and store ads to see which items are on sale and stock up on the basics- pens, notebooks etc. 3. Coupon and cashback. Look online for coupons and take advantage of cashback apps. These little savings can add up in a big way! 4. See what you can reuse. Not everything needs to be new every year. Go through last year’s supplies and see what can be used, passed down and what needs to be replaced. 5. Plan before you shop. Make sure you have your school supply lists along with an idea of what items you already have so you don’t end up overbuying. If you have multiple kids that need the same items you may be able to split value packs as well so make sure to have an idea of what each child needs BEFORE you shop. Do you have an emergency fund in place? You need one!